Our European adventure was effectively two different holidays in one. Part two, which I’ll cover in later posts, was a trip Nicole and I took to Austria. The first half, though, was a road trip with a group of good friends from Aberdeen. Our main purpose was piggybacking on Niall‘s visits to three south of France wonder candidates, though a few extra bits and pieces were chucked into our itinerary along the way. We hired a couple of cars and drove between Toulouse and Avignon (though the others continued on to Montpellier where they flew home). I can’t really do better than this post by Niall to introduce all the gang to you. Toulouse was our point of arrival and gathering, and presented a couple of nights’ opportunity to get used to each other and decide whether we were all going to kill each other over the coming week or not. The good news was we all survived, and had a really nice time in our first couple of days. Toulouse set the tone for the sorts of places we would encounter on our road trip: beautiful old buildings and intricate churches, pretty riversides, relaxed cafes, attractive squares, bustling nightlife, and wonderful food. Yes, the food – our hotel, on being asked for recommendations, suggested a place famed for its duck, and offered to phone ahead to make a booking. This mutual support among the hospitality sector worked in our favour, with a free aperitif as a thank you from the restaurant, and the meal was outstanding. 13 euro for two duck courses, desert and unlimited wine. 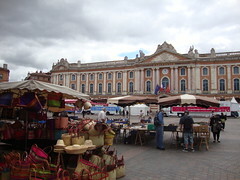 Toulouse had in addition, though, a rough around the edges atmosphere, and our hotel was not far from some dodgy areas of town despite also being handy for the railway station. 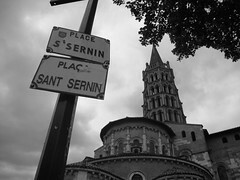 The city also pointed gently towards something that many French might want you to ignore – minority languages, in the form here of Occitan, evident on street names and about which I knew very little. I’m not convinced many locals in this neck of the woods do either: when a language is invisible to the visitor outside the street signs, then sadly it’s probably already a relic. Best of all, however, was the lovely little cafe across the road from our hotel, where we had breakfast each day, chatted to the friendly staff, and watched bits of the Tour de France (more on which later) on the television. 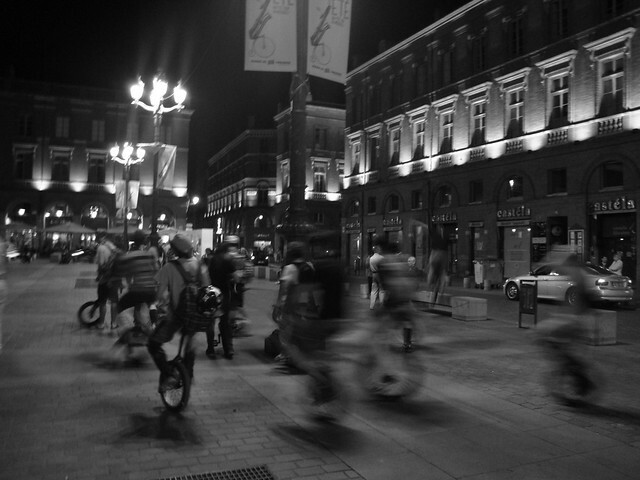 You can see all my Toulouse-tagged pictures here. It was a good start to our journey. But after two days it was time to pick up the cars and hit the road.